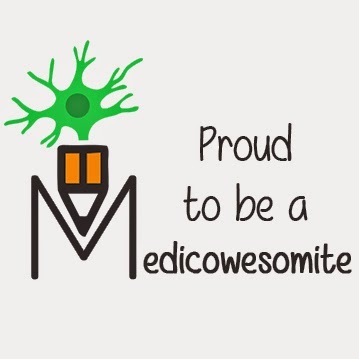 Medicowesome: What is the difference between prerenal failure & acute tubular necrosis? The fractional excretion of sodium (FENa) is the percentage of the sodium filtered by the kidney which is excreted in the urine. In prerenal failure, ADH is high which leads to water, urea and sodium reabsorption. In acute tubular necrosis, there is loss of epithelium of tubules that reabsorb sodium. 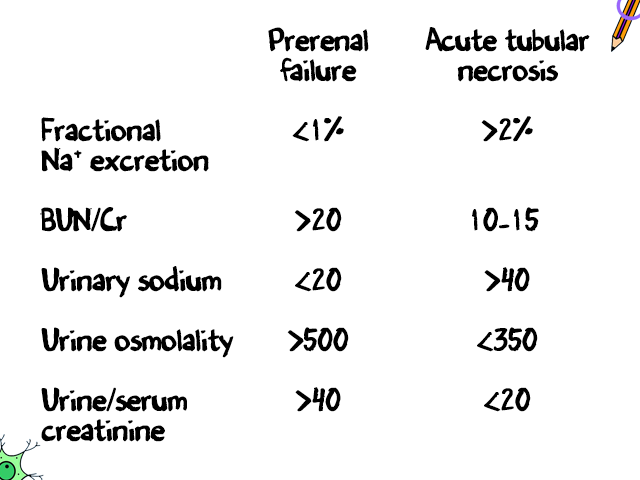 This also explains why urinary sodium in prerenal failure is less than 20 while in acute tubular necrosis is greater than 40. We know that ADH reabsorbs water and when it is high, it will make sure water is reabsorbed from urine. This makes the urine highly concentrated - urine osmolality >500 in prerenal failure. In acute tubular necrosis, the kidney has lost it's function completely - reabsorption of sodium and water is impaired. That is why, urine osmolality is <350 in acute tubular necrosis. and creatinine is the end product of creatine metabolism. In prerenal failure, you have less renal blood flow, you will filter less and GFR will decrease. When GFR decreases, it gives the proximal tubule more time to reabsorb urea. Thus, there is an increase in serum urea. Creatinine is not reabsorbed, but you do get rid of it through the kidneys. When GFR is decreased, there is a back up of creatinine and will not be able to clear it as fast. Therefore, there will be an increase in serum creatinine. There is a disproportionate increase of BUN and creatinine. This leads to the high BUN Creatinine ratio. If the patient truly has renal failure it will affect the BUN and Creatinine equally. Kidney can not get rid of urea and can not get rid of creatinine. Good clear-cut medical definitions here. There was also clever negotiation of medical jargon, and the pictures help! Good job with concision as well.